Definition at line 485 of file commdlg.h. Definition at line 491 of file commdlg.h. 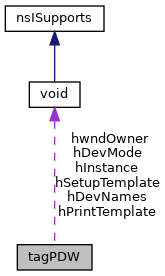 Referenced by dialog_print(), get_default_printer_opts(), MACRO_Print(), pagesetup_change_printer_dialog(), pdlgex_to_pdlg(), print(), PRINTDLG_ChangePrinterW(), PRINTDLG_CreateDCW(), PRINTDLG_GetDlgTemplateW(), PRINTDLG_UpdatePrintDlgW(), PRINTDLG_WMCommandW(), PRINTDLG_WMInitDialogW(), PrintDlgExA(), PrintDlgExW(), PrintDlgProcW(), and PrintDlgW(). Definition at line 490 of file commdlg.h. Referenced by MACRO_Print(), pdlg_to_pdlgex(), pdlgex_to_pdlg(), print(), print_quick(), and PRINTDLG_CreateDCW(). Definition at line 488 of file commdlg.h. Referenced by dialog_print(), get_default_printer_opts(), MACRO_Print(), pagesetup_change_printer_dialog(), pdlg_to_pdlgex(), pdlgex_to_pdlg(), PRINTDLG_ChangePrinterW(), PRINTDLG_CreateDCW(), PRINTDLG_WMInitDialogW(), and PrintDlgW(). Definition at line 489 of file commdlg.h. Referenced by dialog_print(), get_default_printer_opts(), MACRO_Print(), pagesetup_change_printer_dialog(), pdlg_to_pdlgex(), pdlgex_to_pdlg(), PRINTDLG_CreateDCW(), PRINTDLG_WMInitDialogW(), and PrintDlgW(). Definition at line 497 of file commdlg.h. Referenced by MACRO_Print(), pdlgex_to_pdlg(), PRINTDLG_GetDlgTemplateW(), and PrintDlgW(). Definition at line 503 of file commdlg.h. Referenced by MACRO_Print(), pdlgex_to_pdlg(), and PRINTDLG_GetDlgTemplateW(). Definition at line 504 of file commdlg.h. Definition at line 487 of file commdlg.h. Referenced by dialog_print(), MACRO_Print(), pagesetup_change_printer_dialog(), pdlgex_to_pdlg(), print(), print_quick(), PRINTDLG_WMCommandW(), and PrintDlgW(). Definition at line 498 of file commdlg.h. Referenced by MACRO_Print(), pdlgex_hook_proc(), pdlgex_to_pdlg(), PrintDlgExA(), and PrintDlgExW(). Definition at line 499 of file commdlg.h. Referenced by MACRO_Print(), pdlgex_to_pdlg(), PrintDlgExA(), PrintDlgExW(), and PrintDlgProcW(). Definition at line 500 of file commdlg.h. Referenced by MACRO_Print(), and pdlgex_to_pdlg(). Definition at line 501 of file commdlg.h. Definition at line 502 of file commdlg.h. Definition at line 486 of file commdlg.h. Referenced by dialog_print(), get_default_printer_opts(), MACRO_Print(), pagesetup_change_printer_dialog(), pdlgex_to_pdlg(), and PrintDlgW(). Definition at line 496 of file commdlg.h. Referenced by MACRO_Print(), pdlg_to_pdlgex(), pdlgex_to_pdlg(), PRINTDLG_ChangePrinterW(), PRINTDLG_UpdatePrintDlgW(), and PrintDlgW(). Definition at line 492 of file commdlg.h. Referenced by MACRO_Print(), pdlg_to_pdlgex(), pdlgex_to_pdlg(), print(), PRINTDLG_ChangePrinterW(), PRINTDLG_UpdatePrintDlgW(), PRINTDLG_WMInitDialogW(), and PrintDlgW(). Definition at line 495 of file commdlg.h. Referenced by dialog_print(), MACRO_Print(), pdlg_to_pdlgex(), pdlgex_to_pdlg(), PRINTDLG_UpdatePrintDlgW(), PRINTDLG_WMInitDialogW(), and PrintDlgW(). Definition at line 494 of file commdlg.h. Definition at line 493 of file commdlg.h.